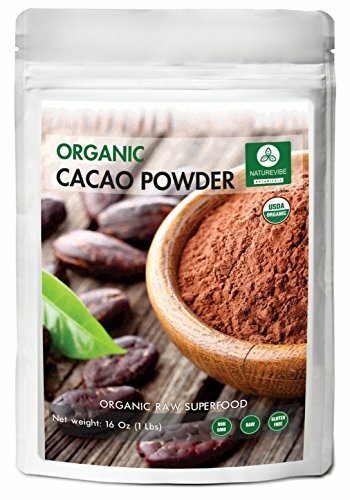 ► Nutrient Dense Superfood Cacao powder is one of the most sought after ingredients due to its rich flavor and potential to be turned into delicious chocolate. It is simply chocolate in its purest form without any of the additional ingredients that get mixed in with it. There is numerous health benefit of organic cacao powder as it is great source of Antioxidants, Fiber and Iron. It assists with Insulin Sensitivity by promoting healthy blood sugar level. It also elevates Brain Health and Mood with its delicious taste and smell. ► The nutrients and organic compounds found within cacao powder target a number of areas in our system to help facilitate a healthier body, mind and overall well-being. Cacao Powder is rich in a number of essential minerals: magnesium, sulfur, calcium, iron, zinc, copper, potassium, and manganese. Some times it is also called by scientific name Theobroma, means "food of the gods" may help increase your focus and alertness to keep you happy. It contains a wide array of unique compounds, properties, antioxidants and minerals that enhance both physical and mental well-being. It can be added into smoothies, dessert recipes, cereals, soups, oatmeal and salads. ► At Naturevibe, we specialise in manufacturing the powder in extremely favourable conditions from the land of exquisite spices, India. We follow the "farm to fork" process, wherein we take pride in having a conglomerate of farmers who are specially trained to hand-pick the finest raw material, which is then manufactured organically and ethically in our state of the art facility. Cacao Powder is packed with healthy fats, fiber, iron, calcium, antioxidants, magnesium and other vitamins & minerals. Cacao Nibs as a whole food can be mixed into yogurt, cereal, trail mix, ice cream and smoothies. Nutrient Dense Superfood Cacao powder can be blended with sugar, milk and other additives to make sweet chocolate. It may help boost mood and improve cardiovascular health by increasing circulation, may also provide anti-aging benefits. USDA Organic, Kosher, Non-GMO, vegan, gluten-free Cacao Powder promotes overall brain health. If you have any questions about this product by Naturevibe Botanicals, contact us by completing and submitting the form below. If you are looking for a specif part number, please include it with your message.